As you know, we just got back from a cruise vacation. Yes, we sailed on Royal Caribbean's Mariner of the Seas, a-g-a-i-n! Why, oh why? Firstly, considering it was a last minute booking, this was the most value for money option we could find during that peak period. Plus, with all the dismaying news of air tragedies, travelling by sea seemed like a safer bet. Secondly, we really love cruising as a family and welcome the idea of being in a floating resort packed with lots of fun activities. No more hassle of checking in and out of hotels, no more worrying about food or lodging, no more wrestling with bulky luggage; instead it is a perfect family vacation with something for everyone - fine dining, luxurious spas, pools and jacuzzi, bars and lounges, dance parties, skating rink, excursions, kids club, theatrical shows, rock climbing wall, arcade, casino, games and the list goes on. 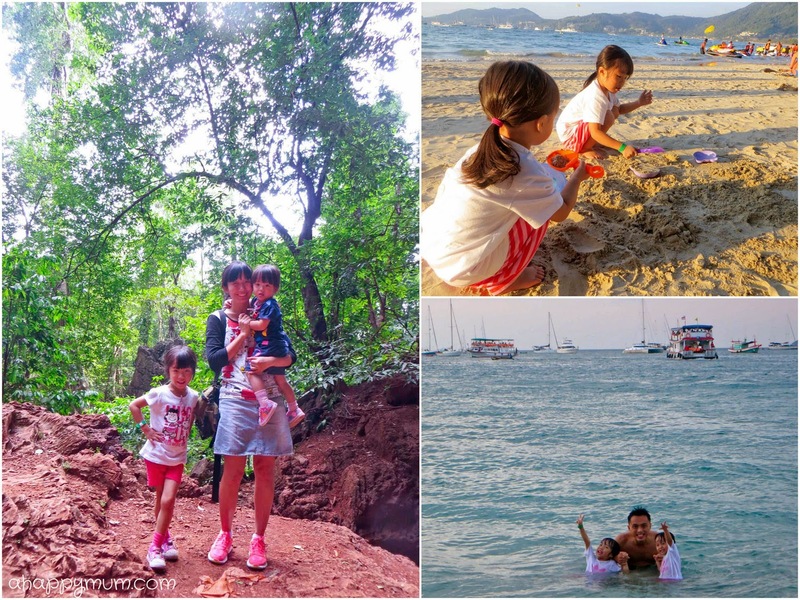 Considering this was our 5th cruise as a family and that we've explored places like the Mediterranean, Baltic Sea and Norway before coming back to Asia, today, I'm sharing with you 15 tips for cruising with kids which will hopefully come in handy for you in future. Especially for the first timers, research your cruise options before booking your vacation. Take into consideration the pros and cons of each cruise line including not just price, but also childcare options, family activities, meal options, cabin size and layout. When selecting a route and itinerary, consider the number of at sea days, the ports of call and the list of shore excursions to determine if they are suitable for your family. If you are traveling with a baby or toddler, remember to check the minimum age requirement as different cruise lines have different policies. For instance, MSC Cruises has no minimum age limit whereas Royal Caribbean and Disney Cruise Line welcome infants who are at least 6 months old. Just so you know, Angel went on her first cruise at 8 months old and we had a pretty good time! Another thing you would need to check is the onboard age requirements, for instance the minimum age for the kids club. Also, take note that most cruise lines do not allow children who are not toilet trained to use the swimming pools. though some ships do offer a splash area for diapered tots. Allow those kids who are big enough to play a part in the planning process. For instance, you can involve them in booking the cruise and going through the list of shore excursions. Explain to them which countries or cities they will be visiting and if you have the time, go to the library to borrow some books on these countries and introduce them to the different cultures, history and people. Take some time to also describe to them about the ship, how it works and how they should behave or look after their own safety onboard. Most cruise lines operate on a onboard cashless system and permit guests to keep a running tab of their expenditure, including drinks, services, shore excursions, gratuities and souvenirs, with the swipe of a key card. On the last day of the cruise, you can choose to settle your bill by cash or credit card. It is wiser to set a budget aside and check your expenses regularly so that you will not have a shocking bill to end your holiday. Also, if there are any discrepancies, do check them out soonest at the guest service counter or you will have to wait in line with 200 other passengers on the last morning. One good thing about cruises is that your luggage will be stowed and delivered to your room for you once you check in at the cruise terminal. Although cruise lines may have less strict limits on luggage, for instance Royal Caribbean lets you take on board 200lbs of luggage, you will still need to adhere to the airline limits if you are taking any flights. Remember to pack in more clothes for the kids and save up on the cost for onboard laundry services. Here's our travel packing checklist for your reference. One most important tip is that since it can take several hours before your luggage is delivered to your room, for instance we had to board our cruise by 3pm but were informed that it could take up to 9pm before all guests received their luggage, you should always have your essentials in a hand-carry bag. These will include identifications, cruise documents, valuables and if you have a baby, plenty of wet wipes, diapers, baby food, snacks and formula. If you would like for the kids to go for a splash once you board, you will also need their swimsuits and sunscreen. Make sure you select a cabin that suits your budget and is appropriate for your children. We have tried out interior stateroom, balcony stateroom, ocean view stateroom and during the last cruise, it was the first time we booked two adjoining cabins since there was no other option available for a family of four. To our pleasant surprise, the cost was almost the same as the previous year but this time round, we had two big beds, two toilets, two TVs and much more space for the kids to run around. We even played hide and seek and found several good hiding spots! In any case, always check the layout of the cabin before you book, determine its location on the ship, and once you are settled in, make sure you brief the children about safety issues and attend the muster drill to know what you should do in an emergency event. 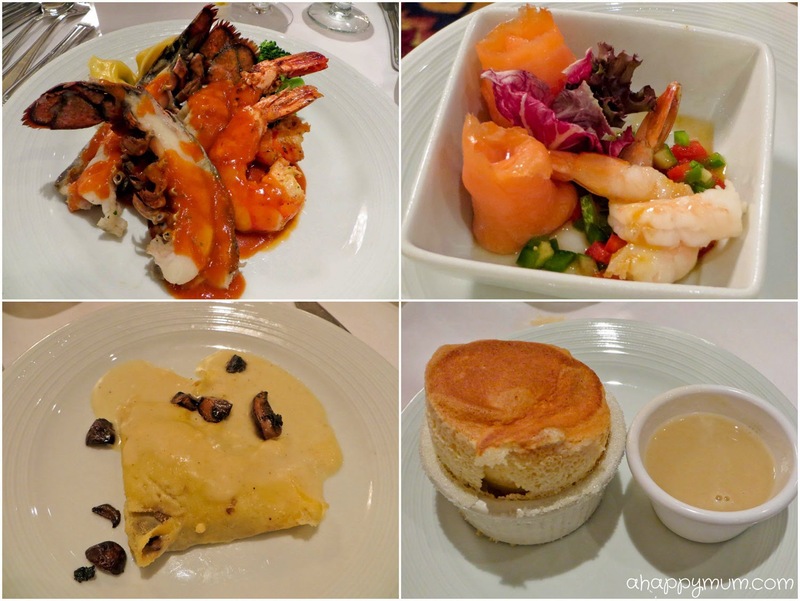 Being on a cruise vacation gives you the chance to feast like kings and queens. You can enjoy the fine dining options at your main dining room, opt for the buffet style dinner in another or try out the specialty restaurants (extra charges might apply). Breakfast, lunch and dinner are all well taken care of and some snack bars might even be open 24 hours. Of course, you can always call for room service too! If you are bringing along a baby, note that some cruise lines do offer congee for the babies or toddlers but in case they don't like it, it will be safer if you bring along his/her favourite baby jar food too. If you have any special dietary needs like gluten free or nut free, most cruise lines are happy to accommodate too. From our experience, you usually get to choose between first seating (starts from 5:45pm), second seating (starts from 7:45pm) or schedule your preferred timings for your dinner. We usually opt for the first seating so that we can catch the show after dinner and hang around a little longer before going to bed. Once you are on board the ship, spend some time getting your directions right and knowing where the facilities are located. Remember whether your stateroom is on the port or starboard side, which way to turn and which lift to take to get to the common facilities including the dining room, swimming pool and theatre. Some cruise lines like Royal Caribbean now offer digital wayfinders so you can make use of smart technology to find your way around the ship and get up-to-the-minute activities schedule. Nonetheless, considering how huge the ship is, it still can get a little confusing at times. You wouldn't want to get lost if the kids are with you and end up missing the start of the DreamWorks character breakfast which now charges $10 per adult. True story. Do also remember to make use of the facilities and don't be afraid to try out new adventures amidst the ocean like ice skating, wave riding, rock climbing and even sky diving. One of the highlights of a cruise vacation is the shows which include Broadway, opera, magic, musical, circus and so on. We will make sure we are there to watch every one of them and if we like it, we stay for the entire show. If we don't, we can always leave halfway. The good thing is my girls love anything that has music and dance, so they are usually very captivated by the performances. In Mariner of the Seas, there is also an impressive ice skating performance Ice Under the Big Top which took our breaths away both times we watched it. So, do make sure you don't miss it if you are there. In addition, if you are on a cruise line that has the characters and mascots to delight the kids, there is usually a parade so try to arrive early to get a good spot. Going on cruise vacation makes it possible for romantic couple dates. Hooray! Right, I say that but it has not happened for us because Ariel is stuck to us 24/7 for now. Even Angel, who was a little unwell. only wanted to be away from us for a few hours only so we basically stuck as a family for this cruise. If you are planning for a couple spa, dinner for two or a romantic stroll at sunset, check that there are babysitting options for your children. Cruise lines offer childcare services starting from different ages and you wouldn't want to know the minimum age requirement at the very last minute. For Royal Caribbean, the Adventure Ocean requires children to be at least 3 years of age to participate in their activities but the Babies and Tots Nursery do offer a drop-off service in the daytime and evening as well as provide private babysitting in staterooms at a nominal fee. Don't forget that a cruise is also a great time to bond with your kids. So, while the kids club might sound like a terrific option, make sure you also spend enough time with the kids, give them lots of love and attention, and most importantly, have fun together as a family! One good thing about going on a cruise is for that you might get to set foot in a different city each day! I remember for our MSC Cruise around the Mediterranean, over a span of 8 days and 7 nights, we visited Genoa (Italy), Marseille (France), Barcelona (Spain), Tunisia (Africa), Messina (Italy), Valletta (Malta) and Rome (Italy). Fwah, imagine all the sights we saw! That said, we realised that cruises in Asia are a little different and while the shore excursions might not offer as much stunning scenery or beautiful landscape as in Europe, you do get to do things like visit places of interest, go on elephant rides, do shopping, climb caves and enjoy local delicacies. If you are taking the shore excursions, do make sure to book them early and check the minimum age requirement if you have kids. You can also choose to go the free and easy way and check out the port on your own or arrange for a private tour too. Do whatever works best for your family. Some people were surprised that we brought gowns and suits for a cruise vacation. If you do not know, there is a dress code for every evening and depending on your length of cruise, there will be at least one formal night. Some cruisers dread formal night but experience tells us to just embrace it because it might be a rare opportunity for you to get dressed up and pose for a family photo. Why, I even saw couples dressed in tailcoats and evening gowns when we were in Europe though that will be a rare sight here. 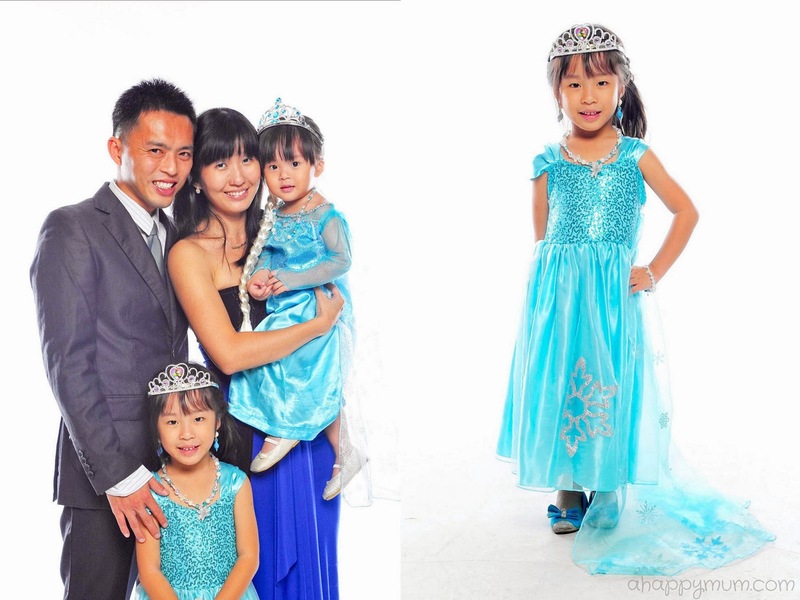 Even if you go for cruises every year, the thing is that the kids grow up every year too so those family shots will definitely be precious keepsakes. Did you see how ecstatic my girls were to be dressed as Elsa? As long as it makes them happy, why not? If you do not intend to pay for any photography package, remember to bring along your own camera but bear in mind that they will not let you make use of the professional backdrops if so. There's nothing wrong with missing out on a day of breakfast or an afternoon of activities just to rest and relax in your own stateroom. A cruise vacation is the perfect time to loosen up and unwind, so bring along your favourite novel or play a few games of Candy Crush if that makes you happy. Even though we have the kids with us, the hubby and I will take turns to look after them once in a while so that the other can have a little me-time off. That really helps to invigorate and recharge our energy levels. Lastly, just remember that things rarely go as planned. Since you are on vacation, be flexible and have an open mind. If the shore excursion you badly wanted turns out to be fully booked, go for the next best option. If someone falls sick during the cruise, you might need to change your plans to involve less strenuous activities. If your kids have their heart set on certain activity, let them do it even if it eats into bedtime. In other words, just let go, let loose and let it be! So, that summarizes our tips for a happy family cruise and how to make the most out of it. Remember to let your hair down a little, dance like no one is watching and laugh like no tomorrow to make your floating vacation become a beautiful, everlasting memory for you too. Looks like you had a lot of fun! Great tips! We've only been on one cruise trip and it was a short one!